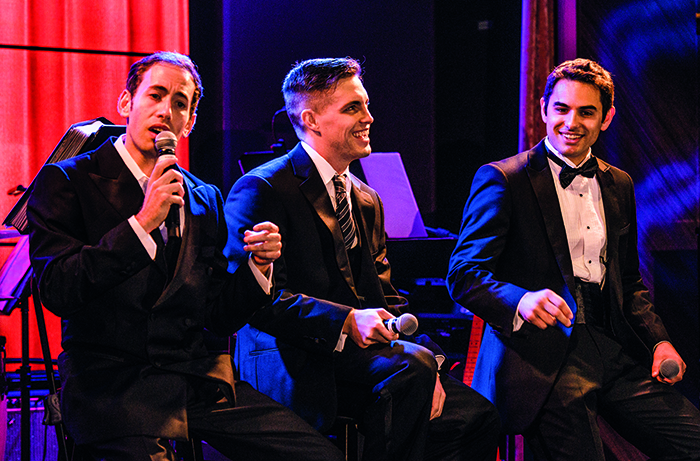 The Rat Pack have just walked into the crowded nightclub and the singers – one Dean Martin, two Frank Sinatras – are crooning We Open in Venice, much to the delight of the audience, who are all singing along and enjoying the attention of the very handsome trio. These guys may not have been born until 30 years after the original Ocean’s 11 film was released, but they certainly know how to work a room. This isn’t, perhaps, what one might expect on a Viking ocean cruise. 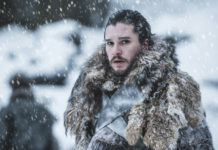 Sophisticated Scandi-chic interiors, Norwegian-influenced food and an emphasis on destination immersion, yes; but the first-class entertainment in Torshavn, the New York-style nightclub, and also in the Star Theatre – well, this is actually a revelation. My Explorer suite has a wraparound balcony with plenty of space for loungers and even a table and four chairs, the perfect spot to have breakfast in the sunshine and enjoy the ocean views, or recline with a glass of Champagne in the evening and watch the sunset. There’s also a coffee machine, closet, sitting room, complimentary mini bar and a bathroom with a walk-in shower and bath with ocean views. 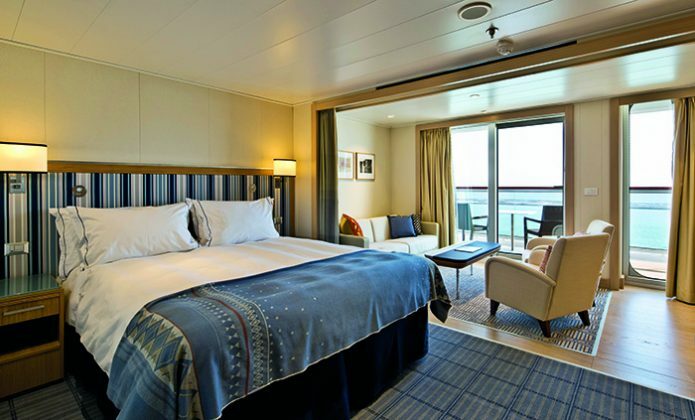 On Viking ocean ships, though, every level of accommodation is of a very high standard, and the Explorer’s beds, with their deliciously soft bedding, are some of the most comfortable I’ve slept in on a ship. Everything is designed for relaxation; as soon as you choose a lounger by the pool (and there is always one available, even when the ship is full) a crew member appears with iced water and a cold facecloth. I’m also a big fan of the quieter infinity pool, although I notice many guests choose to relax inside on one of the exquisite chairs with a good book (there are lots to choose from) or playing games. During my five days on board Viking Sea, the sister ship to Viking Star, we have one port of call – Valletta in Malta. I join the included excursion, which involves taking a coach to various points of interest; the guide is extremely knowledgeable and friendly, and while I would have liked a little more time in some places we visited, particularly the fishing village of Marsaxlokk, with its pretty traditional Iuzzu Maltese fishing boats, it certainly gives you a taste of what the island has to offer. The highlight comes in Żurrieq, one of Malta’s oldest towns, where we’re taken to a vantage point for the famed Blue Grotto: it’s every bit as breathtaking as you imagine, and the water is (depending on where you’re looking) the colour of lapis lazuli and aquamarine. 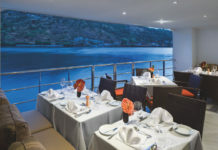 While at sea I take full advantage of the opportunities to try out the different dining options on board: these are all included in the price of the cruise, as is wine or beer with lunch and dinner. My favourite restaurant, Manfredi’s, has an authentic Manhattan look and feel, with an open kitchen, and serves some of the best steaks I’ve ever had at sea, cooked to perfection, as well as an array of freshly made Italian antipasti and pastas, crispy calamari and divine desserts. 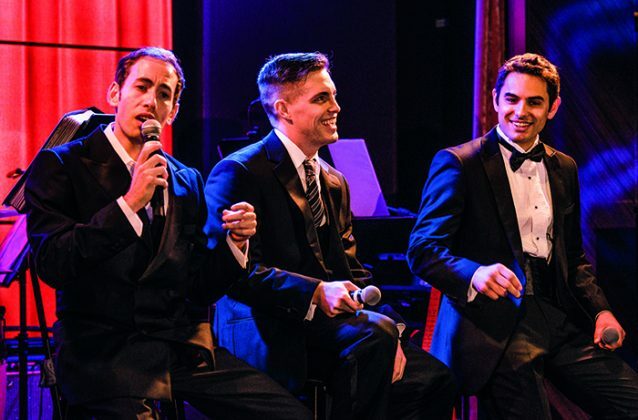 As an added bonus, one evening while we’re there ‘Dean Martin’ from the Rat Pack, who is dining in the restaurant, suddenly stands up and sings O Sole Mio to the accompaniment of an accordion. It’s completely spontaneous and astonishingly good. The Chef’s Table is an experiential restaurant with different themed menus; some of the food is a little out there – on one menu the dishes come with a lot of white foam, and it’s the first time I’ve ever had purple mashed potato; but the Venice menu is outstanding, with superb beef carpaccio and cod. A big feature of this dining experience is the wine pairing, and the sommelier explains everything in charming detail. Mamsen’s, which was created as a tribute to Viking Cruises’ Chairman and Founder Torstein Hagen’s mother, has wonderful open sandwiches, warm waffles served with fresh cream and fruit, and delectable gateaux. Even the World Café, the buffet-style restaurant which leads on to the Aquavit Terrace, offers incredible food, including sushi, freshly prepared in front of you. Also very good are the toasted Reuben sandwiches at the poolside grill, although trust me, one half is more than enough. 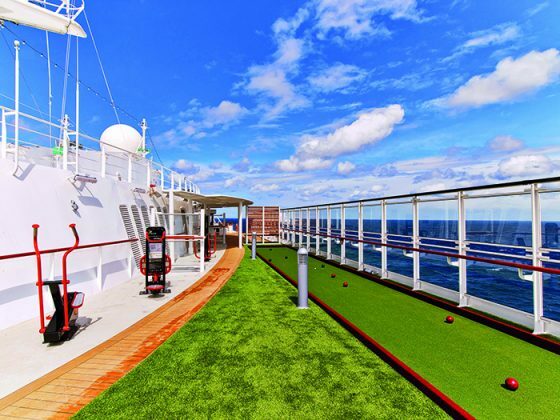 Fortunately there are places to work this off, including a good-sized gym and the spa, but on the top deck you can find various easy-to-use workout equipment, including a fun cycling machine, and a mini golf course. One of the hallmarks of any Viking cruise, river or ocean, I think is the staff: they are always smiling, charming, and willing to help. I’m impressed that one of the waiters remembers my favourite cocktail (made with Sicilian limoncello and Drambuie, and deliciously addictive). 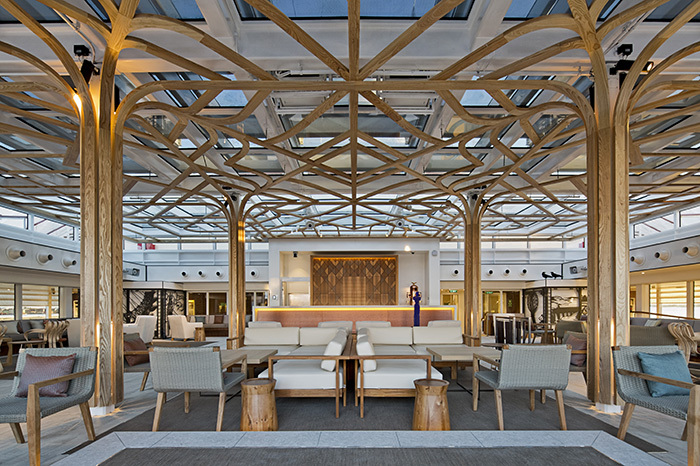 It’s this ship-wide attitude that helps create the convivial atmosphere on board – one of instant relaxation, as though you’ve arrived home. Music, too, is a constant theme: the very good afternoon tea in The Wintergarden is accompanied by a trio of musicians and there are nightly performances in the splendid atrium by a pianist who is so talented he eludes regular ovations. 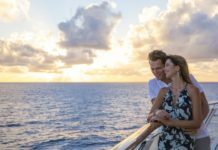 The guests I meet on board are well-travelled and enthusiastic: there are a lot of British people on this itinerary, as well as Americans, so it’s a very mixed bunch, but with a shared interest in exploring and the finer things in life. On my final night on board, there’s an ABBA tribute in the Star Theatre; the Rat Pack singers have now transformed themselves into much younger versions of Bjorn and Benny, and have been joined by three Agnethas/Anni-Frids; while they’re not attempting to be the Swedish super group, they do sing all the favourites, and again the standard is incredibly high. 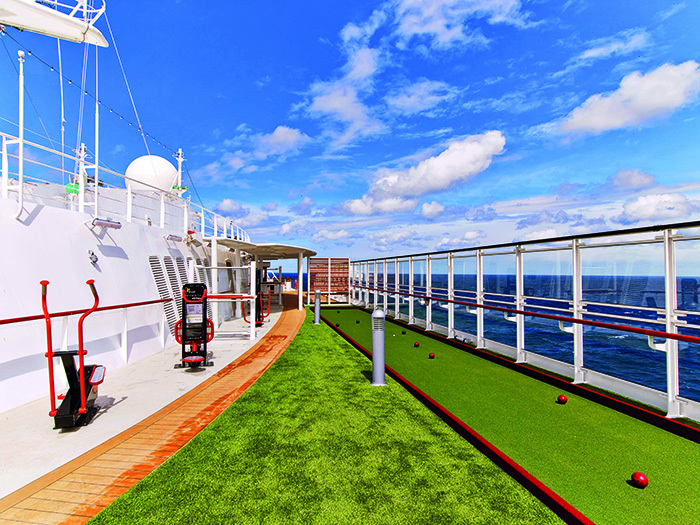 Like everything about the Viking ocean cruise experience, in fact. GETTING THERE: A 15-day Cities of Antiquity & The Holy Land itinerary sailing on 9 November 2017 starts from £5,090pp, based on two people sharing a Deluxe Veranda room. Price includes all meals on board, wine, beer and soft drinks with dinner, nine guided tour excursions, transfers and flights. For more information, go to vikingcruises.co.uk/oceans.